So many of my friends have often asked me what exactly Colombian food is. For many Texans (and Americans in general), they generalize Colombian food as being very similar to Mexican food. Well not surprisingly, just like USA has many different types of traditional food depending on the region, ethnicity, and culture of the country, Latin and South American countries are the same way. For example, Colombia does not really eat spicy food such as salsa, or jalapeños. There is no queso, no tacos, and no enchiladas. In fact, much of Colombian food comes from locally sourced available food. We have a plethora of fresh tropical fruit juices (some of which are only found in the Andes Mountains; such as lulo), plantains, fresh avocados, regional potatoes, rice, beans, and local meat. Now that I have my fancy camera, I really wanted everyone to get an idea of some of my favorite traditional meals from my homeland. Like I said earlier, just like USA, Colombia might have different twists on some traditional recipes. The ones I'm about to showcase are some that my family has always made, and my "foodie blogger" attempt at describing the pictures will be below the photos. Let me know what you think! 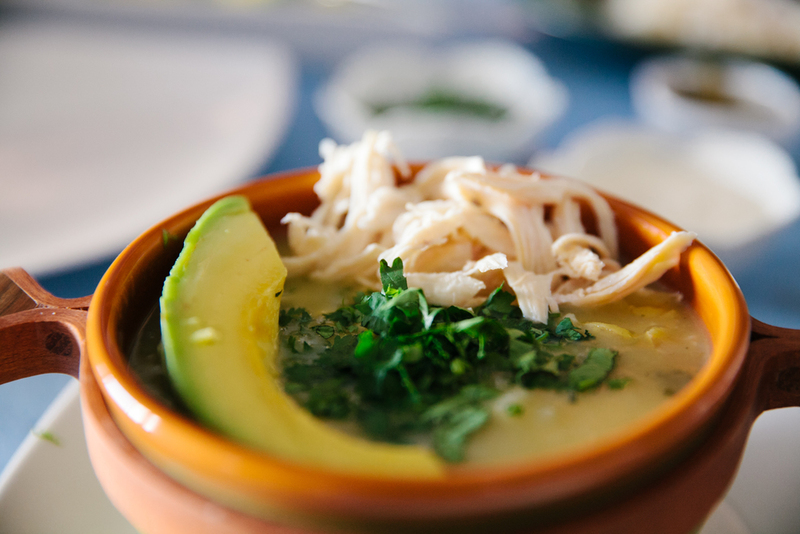 Ajiaco santafereño is a Colombian potato soup typical of the capital of the country, called Bogota. Just imagine the most creamy, savory, delicious potato soup you have ever had, and times it by 3. Why 3? 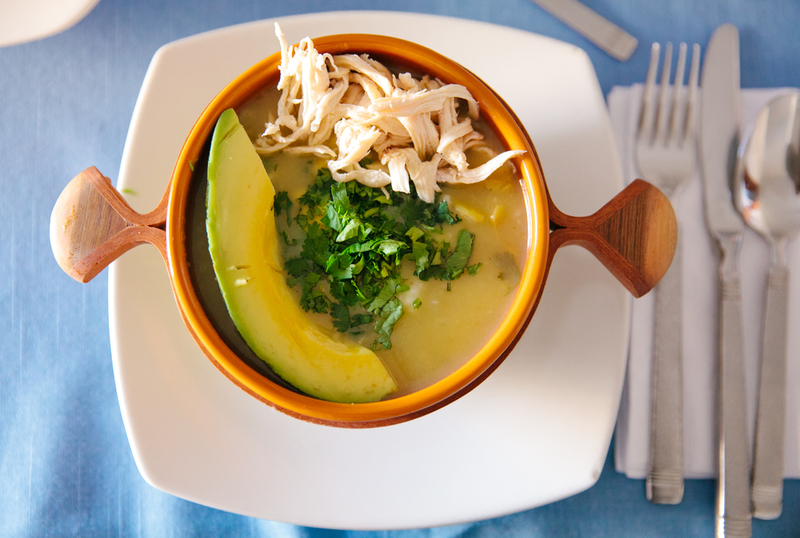 Because this soup is made of 3 different types of regional potatoes from the Andes: the criolla, sabanera, and pastusa. Warning : You WILL eat three bowls, and need a heart nap as hearty as that soup. Side note: if you add shredded chicken, a heaping spoonfull of cilantro, fresh avocado, and corn... your life will be changed. Trust. In case you didn't know what ceviche was, it is fresh white fish that is placed in a bag and cooked with time and lime or lemon juice. Many different countries have their own twist on this magical seafood goodness. 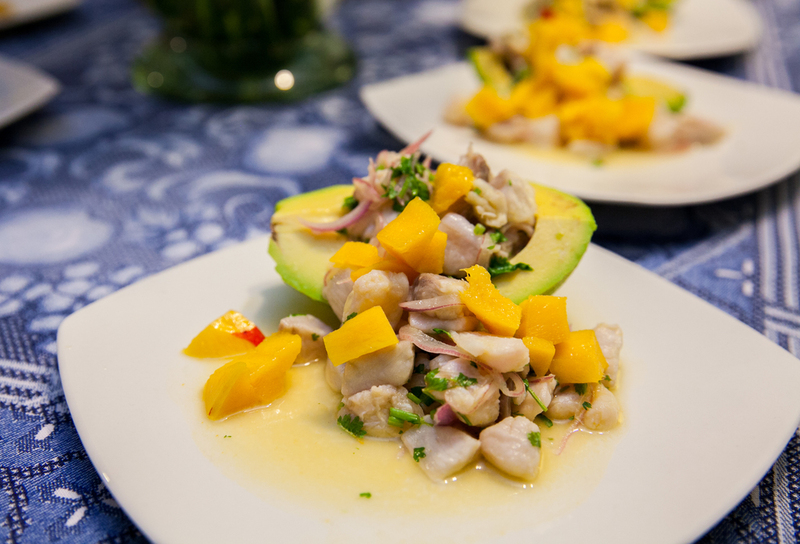 For this particular ceviche, we used fresh tilapia, mangos, cilantro, purple onion, fresh minced garlic, seasoning, and my step-mother's secret recipe (this Peruvian sauce that a friend of hers bring back from, well, Peru). We added the avocado as a natural bowl, and OH MAN> SUCCESS. If you've ever visited or lived in Latin or South America, you would have noticed that milanesas are a commonplace dish, served in almost all traditional restaurants and cooked in almost every household. 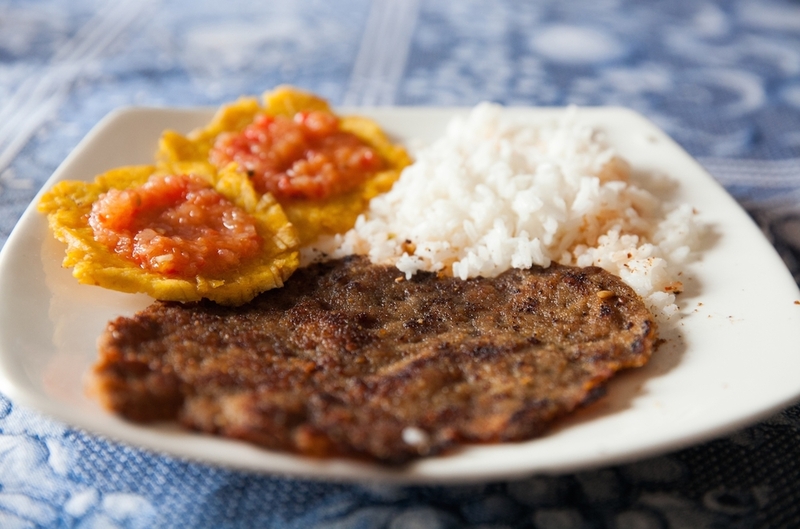 A milanesa consists of a thin slice of beef, chicken, veal, pork, or even eggplant. Each slice is dipped into beaten eggs, seasoned with salt, and other condiments like garlic or parsley. Each slice is then dipped in bread crumbs and shollow-fried in oil. This is one of my sister's all time favorite meals. However, the ones we eat are my grandmother's special semi-secret recipe from Uruguay. And I am going to share those tricks of the trade with you. 1. Buy pork over other meal. Not already packaged pork. Go to the local butcher and get a big, heart amount of lean pork for the amount of people eating. 2. Use a super sharp knife to cut the pork into thin slices of meat. Then place those slices on a flat surface with some flour below them. Once on the flour, pound them even thinner. The thinner the meat is without breaking, the better. 3. Typically we use specific Colombian breadcrumbs bought from the local supermarket, but Panko will work just fine. Extra tip, double bread the meal. Egg. Bread. Egg. Bred. Fry. In our household, we eat milanesas with fried plantains, hogao (tomato and onion salsa-like topping), rice, and a salad. You can imagine the afternoon nap that is needed after this meal too. Otherwise known as "Beef Rib and Potato Broth" soup, this traditional Colombian food is a classic "long night out" cure... if you catch my drift. Many times, nightclubs sell caldo in the early morning, or it is served at 7am after a wedding reception to hungry guests. My memory of eating caldo is at my uncle's dairy farm. I would happily wake up at 4am to eat warm caldo with the farm workers before they went off to milk the cows at dawn. I have many other normal breakfast memories of eating this savory breakfast soup. So yes, mind blow, people DO eat soup for breakfast... and it is DELICIOUS. I'm sure a lot of people have tried the Cajun version of Red Beans & Rice... but this style of red beans and rice takes savory to a whole new level. If someone asked me what my last meal to have on earth would be, it wouldn't be hard to come up with an answer... it would be frijoles. A mix of delicious red bean cooked with pork, green plantains, corn, fresh avocado, and ground beef. This meal is served as a soup, a stew, or over rice. The beautiful city of Medellin makes their own version of the meal called "La Bandeja Paisa". In this case, you get a full flank steak or ground beef over red beans and rice, with a fried egg on top. On the side you get avocado, chicarron (fried pork belly), an arepa with hogao, plantains, and sausage. Clearly, this meal is not for the faint of heart. Colombian tamales serve as the perfect breakfast, lunch, or dinner food. Wrapped in banana leaves, tamales are cooked corn dough filled with meat, chicken, rick, potatoes, peas, carrots, corn, and spices. Our family typically gets these for our traditional Colombian breakfast. We eat these with arepas (the base side to any Colombian meal. It is a bread made from cornmeal, similar to a thin pancake. It is normally eaten with jelly or a thin slice of cheese in the middle of it or on top), hot chocolate, eggs, and fresh juice. Oh and coffee. Can't forget Colombian coffee. Something that is probably not thought about often is the variety of exotic fruit that can be found in other countries, particularly Colombia. Above is a picture of my favorite lemonade ever. It is a special variety of mint that is infused with fresh lemonade and made to perfection. The colors, flavors, and textures of the different fruits are not to be missed. A lot of the meals at restaurants and at home are always had with fruit juices.